I remember it was something like 10 years ago. I had just recently started discovering the world of progressive rock. It wasn't as easy as it is today. Some of the best websites were either in their infancy stages or weren't even around and the slow dial-up connections made matters even worse. There was an Internet forum I would frequently visit. I don't remember if it was about progressive music in general or if it was the Genesis forum. In any case, I was a big fan of Genesis and their music still made up about ¾ of my listening pleasure. So I felt it was time to branch out a bit. I was already on my way with some of the bigger names in the business, but I was also looking for newer music. Somehow I stumbled onto the name of KingBathmat (aka John Bassett). I went to the website and saw that you could download a few songs for free (legally). If my memory serves me right, I believe the songs were King of the Fairies, Not Born to Share, Post Traumatic and As Ever. At the time, I was looking for bands which sounded like Genesis, so my first impression was that it sounded nothing like Genesis. But also because of the limited possibilities of the time, I stuck with these songs and they really grew on me. It wasn’t really progressive rock as I knew it at the time, but it was very nifty art rock with extremely catchy hooks and solid playing. I don’t really remember where life’s journey took me next. I would still listen to the CD with these songs every once in a while. Slowly, however, this CD either got damaged, went to the bottom of the pile, or was simply slightly forgotten. But the memories never went away completely. I still remembered the great feelings the music brought me and the talent of John Bassett. So it came to be that while I was off pursuing other musical avenues with my reviewing hobby, I was contacted by StereoHead Records if I was interested in reviewing the new KingBathmat album. A new KingBathmat album? Could it be? All the memories came flooding back. I even went looking for the old CD, but alas, it was nowhere to be found. I was naturally very keen to find out what John Bassett was up to, so I jumped at the chance. 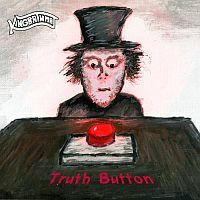 I was soon to find out that the new album, Truth Button, wasn’t just about John Bassett as before, but KingBathmat was now a full band, of course still formed around the song-writing talents of John Bassett, but I was glad to see John was still taking care of business and even branching out with a full band. The first thing that hit me right from the get-go was how much heavier the music has gotten. We can hear massive hard rock and stoner riffs, which I hadn’t heard in the past. The songs have gotten longer and definitely more complex. John’s great sense of melody still remains, but some of the arrangements send the music into the territory of progressive rock, while some of the more ambient parts and spacey guitar solos also have a psychedelic / space rock feel to them. While I loved KingBathmat of old, this might even be an improved version because you have all the elements from the past, together with several new twists. While the guitar parts are phenomenal, I also particularly enjoyed the vast array of keyboards used by David Georgiou (also some vibes samples). At the end of the day, my conclusion was that this wasn’t the King Bathmat of old. It wasn’t a trip down memory lane I might have wanted. In a way, I was hoping to pick up where I left off and was sad that the music has changed so much, but John has gotten only better at his craft, so I was also pleased to discover KingBathmat all anew. It’s almost a different band. The wonderful tunes are still here, as is John’s recognisable voice, but the idiom has been expanded to include new styles, daring arrangements and even finer playing. I look forward to rediscovering this band all over again.